Welcome to National Association for the Blind - Karnataka, a one-of- its-kind place that aims at making the visually challenged lead a life of independence and dignity. 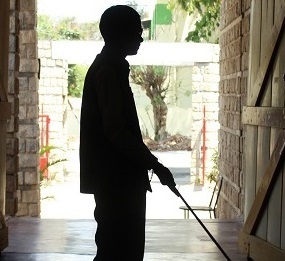 Established in 1977, the National Association for the Blind (Karnataka) is a private, not-for-profit organization that provides services and support system to the visually challenged across age groups, genders and social and economic strata. You can get involved with NAB in many meaningful ways, no matter what your role is. 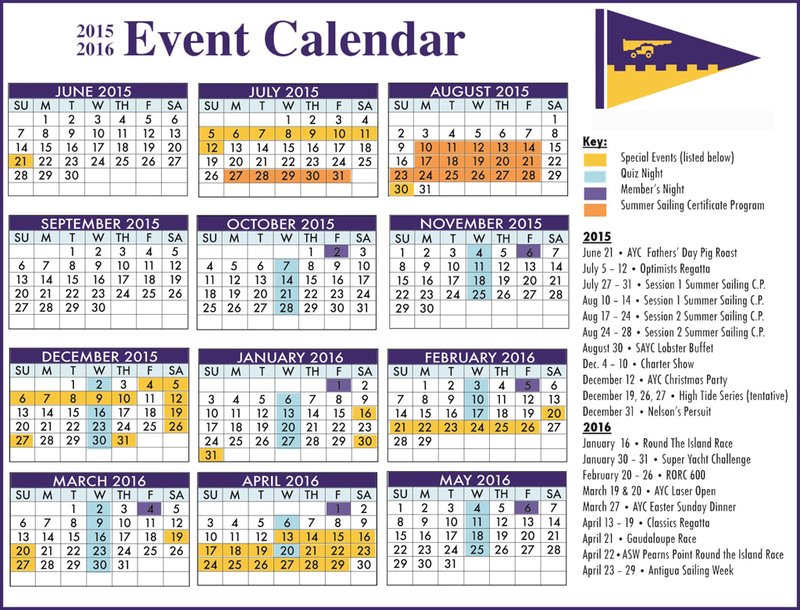 As part of our initiatives, we also plan to organize events that will bring together people, ideas, talent and more. To be held at the National Association for the Blind campus in Bangalore, these events will celebrate talent among the visually challenged, while sensitizing the larger public and spread awareness. Keep watching this space for the latest. And remember, this is an initiative driven by bringing together like-minded people. So do share your own ideas/suggestions, if any, to help us take this forward and reach more people. Renum Kacker was born partially blind to Radhey Krishna Tandon and Sheela Rani Tandon in 1963. At the age of 52, she lost her eye sight completely due to Glaucoma. But she has been working as a Telephone Operator since 1981 and is today working for Bank of Baroda at Bereily, Uttar Pradesh. Choudappa Rangappa Kundargi has had an unusually tough journey through his young life. 33 year old Born to Lt.Rangappa and Lt. Sona Bai in 1985 at Hubli, with normal eye sight he lead a normal life running his own business at the HP Gas Sub-agency in Havery district, Shiggaon, near Hubli. Understanding is the first step towards fighting a challenging or finding solutions. Let's take a look at some basic facts regarding blindness - what causes it, the myths surrounding it, some simple tips, preventive care, etc. "Before coming to NAB my mobility was very low. But after getting trained here, I am able to go anywhere I want, independently. I also enjoyed the computer training I took here. I am now looking for a job." "I first heard about NAB from my friends in 2003 and since then I have been wanting to join the NAB. After taking the training here, I worked in the BPO sector and now I have come back to take the mobility training and also refresh myself in computer training. I find that my confidence is building now. 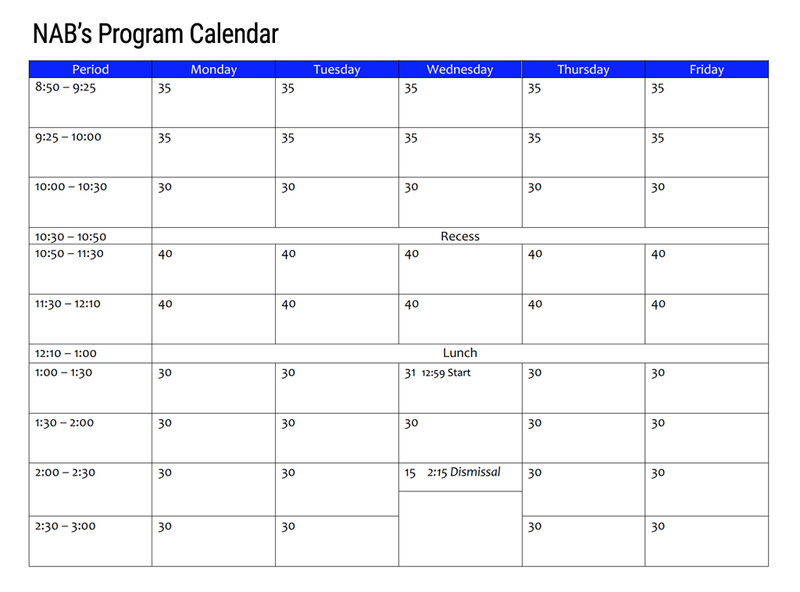 My plan now is to join an IT company. "After having undergone training at the NAB, I feel very confident about managing on my own. My family is also very happy. 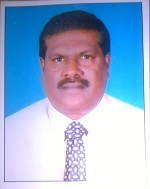 I am now looking for a job in an MNC. I have learnt Bharathnatyam, have given performances and have done my graduation in journalism. I want to tell people that we don't want any sympathy, only the right kind of support. Sometimes people, while trying to help us, only confuse us more. That should not be the case." "Before joining NAB I was very scared to even speak to anyone. But now after coming to NAB, I feel bold and am happy that I'm learning new things like learning to use the computer. My plan now is to start my own business in petroleum products." "After the training here, I feel I don't have to depend on others for everything. Earlier I used to work in a call centre and now I want to get back to a job and pursue my passion, which is cricket. After joining here I came to know that there is something called Cricket for the Blind. So I want to get trained in that." "Our students' families share feedback with us and tell us that the staff here are the most friendly, compared to all other institutions. We don't make anyone wait. And although we are strict as instructors, we encourage the students to talk freely with us. As a staff member, I have many wonderful memories here. NAB has given me everything." 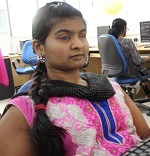 "Before becoming a trainer at NAB I used to have sympathy for the visually challenged. But now after having had experience as a mobility trainer here, I know that what they need is empathy and not sympathy. Here at NAB we have very good relationship with the students, who also discuss their problems with us. Our aim here is to make the visually challenged become independent and come up in life and I am proud that we help them achieve that." "Before joining the NAB I hadn't met any blind person so it was very challenging when I was first joined the training programme. But I soon realized that it was very satisfying to help the blind be independent. Once we undergo training here at NAB, it gets easy to train the visually challenged. They are trained to do even simple everyday grooming activities independently and that makes them very happy." "I am very proud happy to say that I worked with excellent management teams at the NAB- Karnataka. I was sent to attend many national and international seminars and conferences, which enriched my knowledge towards uplifting the visually challenged. I worked with a fabulous, loving and understanding staff who always used to support me whenever I took important administrative and training program decisions." 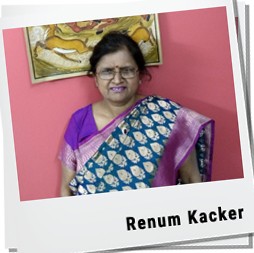 Renum's family is a small and happy family consisting of her husband Anil Kumar Kacker, daughter Rashi Kacker and her son Sanchit, who works for HDFC bank, Bangalore. The family supports her completely. But for Renum it has still been a tough journey. Her challenges after her complete vision loss were many: She could not go to another room without anybody's help, could not recognize currency notes, could not cook as before, could not recognize or select favourite clothes/dresses and she was unable to function well. She finally got to know about NAB through an internet search. Low on confidence and motivation, she decided to join the computer and mobility training course at the NAB. She learnt keyboard orientation, Jaws Software command, MS Word, MS Excel, internet usage and e-mail communications. In the mobility training course, she learnt to walk independently and acquired daily living skills (personal grooming- sighted guided techniques, cane skills) and ILC (Independent Living skills). Today, with the training which Renum has undergone at NAB-KB, she is independent in her mobility and orientation skills. She also has basic computer skills and can send and receive emails as well as any other sighted person. At the age of 31, he was seized by a severe headache and vomiting sensation. He was hospitalized and after 5 days, he was diagnosed with brain thrombosis. Due to this he lost his eye sight. He was shifted to a hospital in Hubli where he was in ventilation for three months and another four months in the Intensive care unit. He had completely lost his consciousness and was in coma nearly for 3 months. After recovering consciousness, he was discharged though by then his nervous system had failed and he had no eye sight or sensation in his right hand. He stayed with his brother at Shiggaon after he lost his eye sight. 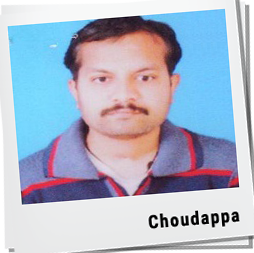 Choudappa's life had changed drastically. He could not walk alone, could not do anything independently and was obviously feeling very hopeless. It was then that he came across NAB through a Google search. He came NAB-KB to get training in mobility and computer skills for one month and four months respectively. He learnt keyboard orientation, Jaws software commands, MS Word, MS Excel, internet usage and e-mail communications. 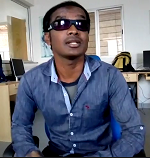 Through the mobility training course he learnt to walk independently, besides daily living skills (personal grooming -sighted guided techniques, cane skills) and ILC (Independent Living skills). Today he can perform basic functions on the computer, his skills being on par with any sighted person. This shows the long distance he has travelled.